Do I really need to give a plot overview of this one? Better yet, let me explain why this story creeps me out. Ever since I was a young child who came across this tale in a Grimm Brothers Fairy Tale book on my parents' bookshelf, I have been spooked by the story of Hansel and Gretel. First, the two siblings clearly have lost their loving mom, only to be replaced by a cold-hearted stepmother (abandonment). Then, the stepmother hatches a plan with dear ol' dad to leave the kids out in the forest so that the grown-ups have enough to eat and not have to share with Hansel and Gretel (adults rule the world). The kids hatch a plan to make it back home. It doesn't work (ineptitude). The wandering children stumble upon a house of sweetness, only to find themselves on the dinner menu for a witch disguised first as a kindly grandmother (powerlessness). Sure, the kids get even in the end (cooked witch, anyone? ), but still ... each step of the way, I felt some part of my secure and safe childhood being toyed with in an evil way. I always wondered: could this happen to me, too? How would I survive if I were left alone to my own devices? Which brings me to this graphic novel version of the classic tale and I can say that this Stone Arch version, adapted by Donald Lemke and illustrated by Sean Dietrich, is strange and odd and creepy in every way you would want the story to be. HANSEL AND GRETEL make good use of the graphic novel format as we see the fragility of the situation etched on the faces of the kids. The artwork by San Dietrich really stands out here. He uses bold and dark colors throughout the book, giving the story an eerie glow of uncertainty. 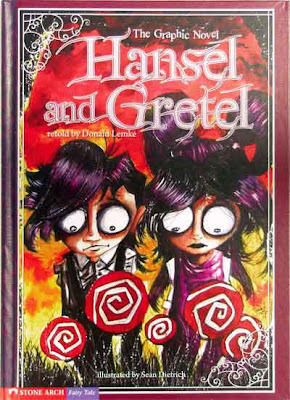 I was put off at first, and still am unsettled, by the huge eyeballs of Hansel and Gretel. They are like spinning globes on their faces, as if some Manga maniac went a little too wild with their pen set. But it has an emotional effect on the reader, which is to show the strange wonder of the situations on the faces of the children. In contrast, the father and stepmother have almost rectangular eyes that represent cunning and evil. And the eyes of the half-blind witch? Hers are dead black – like pools of black ink in which there is no escape. The eyes in this version of the story tell a lot about character, which is fascinating to consider in the graphic novel format. Obviously, this book is a classic fairy tale, and this graphic novel would enhance any unit on fairy tales. As I mentioned in the art review, the use of colors and facial features really could spark an interesting conversation about the choices that an artist makes when trying to retell a classic story. One huge bonus to the Stone Arch fairy tale collection is that in the back of the book, there is a nice overview of where and how the story originated (in this case, the Grimm Brothers may have heard the story of Hansel and Gretel from a woman named Henriette Dorothea Wild, Germany, in the 1800s). The book also features three discussion questions, three writing prompts and then urges readers to explore more about the story on their own. These additions are a nice touch for teachers and students using graphic novels in the classroom. I would highly recommend this book for any upper elementary or younger middle school classroom. The story might not hold much interest with older readers and may be a bit too unsettling for very young readers. There is no inappropriate language or images. I just put this in my amazon shopping cart. Are the others in this series good? We have some reviews lined up for others in the series. Franki, I have a couple of these and I am really impressed with them. The art is different in every one and the fairy tales go back to their roots, as opposed to the Disney versions. My son started a charter school this year and I volunteered to be on a Library committee. They are trying to find a way to find graqnt money to bring in comics/graphic novels into the classroom. After reading Bone graphic novel, I saw so much potential in the classroom and volunteered to assist in finding grants/programs. Do you have some input on where to even start? How does the charter school pay for the traditional books in the library? That's were I would start. We maintain that books are books and whatever funding is used to buy traditional books, magazines, newspapers can and should also pay for comic literature. Keep in mind that most of the school publishers also publish comic lit (Stone Arch, Capstone, Lerner, Scholastic, etc.) I know my school's library gets catalogs from suppliers and those include comics. I am not familiar with how funding for private schools is established, so I am not much help there.